Why is my boss younger than me? Why can't I recognize any song on the radio unless it's tuned to the classic rock station? Why do I want to be in bed by 11pm, although that's rare? Why is it notable if I'm still in it after 7am, which is even rarer? 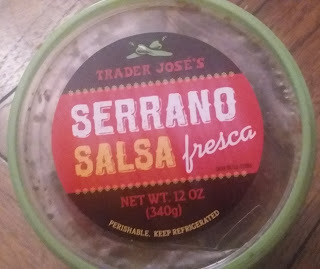 And is Trader Jose's Serrano Salsa Fresca actually spicy, or am I just becoming a wimp? I'm turning 36 this upcoming summer and it's these kinda questions I'm pondering. Growing "old" i guess...I know, I know, but it's a relative term, and so for me, I'm at least not getting younger. Getting back to this tub of fresh salsa straight from the TJ's refrigerated section, it's a pretty potent mix. I'm actually not sure if spicy as in heat is the right word, as there's a lot of flavor coming out. Decidedly, it's a little heavy on the cilantro and garlic, so if you're not a fan of those, you're better off staying away. But there's also subtle sweetness and cooling from tomatoes, a little bite from some onions and peppers, and yeah, a good amount of heat as well. I'll admit the first bite I had seemed a bit vinegary at first, but that must have been a bad sample as none of the rest seemed that way. Overall, there is a restaurant quality vibe to the serrano salsa. The minute little chunks and semi-wateriness seem on par with most nonjarred salsa varieties I've had at the pseudo-Mexican style joints around here in the 'burgh. That's a compliment. But after a few bites, it all begins to get a bit much, and I'm not sure if that's just me getting a little wimpy or not. I had some this morning on my breakfast eggs, and again tonight with a couple tortilla chips, and, well, let's just see what tomorrow brings, if you know what I mean. At least I haven't needed any Rolaids, yet. Getting back to my new old man tendencies, I wasn't able to figure out how to take an adequate picture of nutritional info and ingredients, so I'll just link to it here. Didn't even need the AOL keyword to find it, so ha! Sandy and I will rank the salsa as good, not great, with me sneaking extra pointage for the use of Jose instead of Joe....I like the different characters who seem to be disappearing from the good ol' days. I feel like there is something wrong with me that i just can’t/don’t enjoy spicy foods! I didn’t grow up eating anything spicier than black pepper and although i keep trying again and again the end result is just tears and misery. I can’t even handle TJs pico de gallo! "Why does my knee hurt?" This cracked me up! (my knee frequently reminds me that I'm... older.) Haven't tried this salsa but I might.